Hafi have designed MODEL HE â€“ 125 D, HE â€“ 200 D, HE â€“ 400 D Dust Extractor, a reliable, efficient and cost effective solution to any dry dust control problems in Industry. The MODEL HE â€“ 125 D, HE â€“ 200 D, HE â€“ 400 D Dust Extractor has got wide applications in the following machines and industries: tool cutters/surface grinders, buffing machines, abrasive cut off machines, diamond polishing machines, Carbon dry powder collection, wood working Industry, etc., It provides clean working conditions, increases operator efficiency and prolongs equipment life. Hafi have developed two more Dust Extractors Models HE â€“ 500 D & HE â€“ 750 D with high Air Displacement 1250 cubic mtr./hr.& 1650 cubic mtr./hr. Where you can use the hose dia of 75 mm. The unit is compact, inexpensive and its high cleaning efficiency compares to units selling at higher price. It is easy to operate and needs practically no maintenance. PRINCIPLE OF OPERATION : The dust generated is picked by a slitted hood in an air system generated by powerful suction blower. Dust separation takes place in two stages. In the primary stage, heavier particles are deposited into the collection container due to reduction in velocity and change of direction of air. Secondary separation occurs when the lighter dust is deposited onto the fabric by initial impact and diffusion. Hence, it accumulates to form a mat or bed which in turn acts as filter medium with a fabric as a base. TO maintain continuity of extraction, dust is periodically removed from the fabric by the shaker mechanism and deposited into the collection container. APPLICATION : For collection of Dry Dust â€˜At Sourceâ€� in Industries. Can be used as original equipment with surface Grinders, Tool and Cutter Grinders, Buffing Machines, Wood Working Industries, and also for Carbon Dry Powder Collection. DUST CONTAINER CAPACITY 0.012 CUBIC MTR. 0.006 CUBIC MTR. 0.024 CUBIC MTR. UNIT WEIGHT 50 KGS. 50 KGS. 90 KGS. DUST CONTAINER CAPACITY 15 LTRS 15 LTRS. The simplest, most economical and most effective solution to your dust problem. The extraction fan, type HE is available, in two sizes for extracting dust produced by machinery or fume such as those produced by welding. Stand the type HE extraction fan on the floor or fix it to a wall, place the suction end of the hose as close as possible to the source of dust- and your dust problems are over the strong suction power of all two sizes of the extraction fan in combination with the ingeniously contrived positioning of the dust collecting hood catches the dust catapulted upwards in its complete scattering area. Whenever, Dust must be extracted from machines with intermittent use and in different locations, a portable dust & chip collector is the most economical answer. All portable units with cyclonic separators have exchangeable filter systems for use with a simple filter bag. 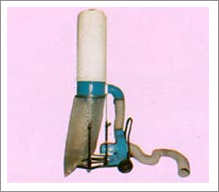 The Hafi method of powerful dust extraction combined with simple dust collection, is used in disposable filter bags effectively and economically. 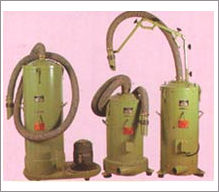 For Extraction and disposal of dust produced by machinery, directly at source. For Extraction and disposal of fumes. For Extraction and disposal of car exhaust fumes in automotive workshops. Extraction of stale air and supply of fresh air for working operations (e.g. welding) in pits, tanks or other insufficiently ventilated confined area. Extraction of dust in small sand blasting cabins. Use as conveyor blower for granulated materials, etc., ON WOOD WORKING MACHINERY.